Turkish society polarised a lot especially since the Gezi Park protest. People form their alliances on the basis of their ideological dispositions. The referendum campaign was not fair. 90% of the media coverage was dominated by the AKP. Many people just heard about the ruling party’s argument that were simply blaming the opposition parties and potential no voters as traitors and even as terrorist that were sort of brain washing activities. After threats and carrot and stick mechanism, it is surprising to see that the AKP could get hardly half of the votes. Despite all these brain washing and also despite the fact that Turkey’s third largest party, pro Kurdish HDP, decimated by the government; half of its politicians in prisons, despite all these limitations, may be not on paper, but opposition won a victory. According to polls, many of the AKP voters said they don’t know what is the constitutional amendment package they voted for but they don’t care because they trust Erdoğan. Because the society polarised a lot especially since the Gezi Park protest, they don’t care what it is actually taking place but they form their alliances on the basis of their ideological dispositions. 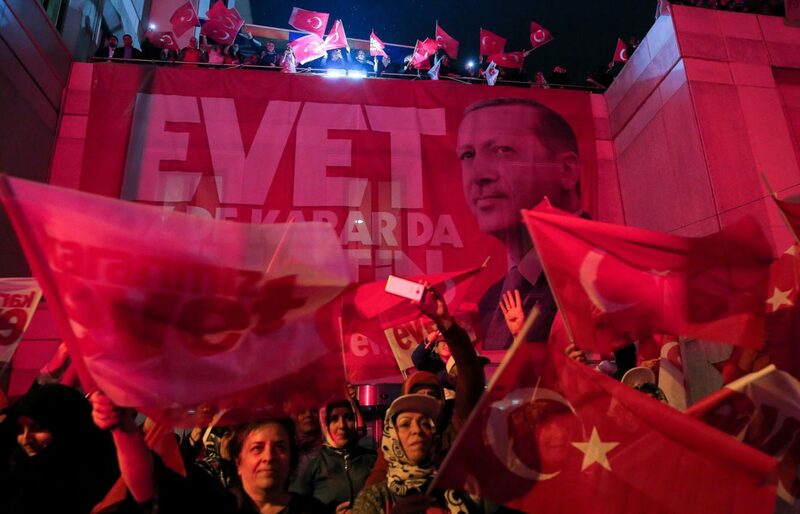 Because the result was almost neck and neck, this is not enough for Erdoğan. He needed to get at least 55% so this created legitimacy problem. What he [Erdoğan] will do within the party... He will simply purge the people whom he thinks secret dissidents, crypto opposing elements. Some people within the AKP also did not voted for yes and that means Erdoğan would take its revenge to get more votes in 2019 elections. The purges within the AKP would also take place. Turkey does not want to see a Kurdish autonomy in the northern Syria. However US and Russia seem to have a different opinion about the Kurds in Syria. Turkey’s relations with Iran is getting worse. Turkey’s pro-Sunnist approach, Salafaisation of Turkey and also its intense relation with Qatar and Saudi Arabia, the financial support Turkey gets from these countries creates problems in relations with Iran. Turkey interfered with the elections and divided a Turkish Bulgarian party and created its own proxy party. Bulgarians are upset with that. Turkish Consulate in Bulgaria is declared persona non grata. There is also no hope of EU membership for Turkey. Turkey could even leave membership of Council of Europe that is home to the European Court of Human Rights. There are thousand of cases because of post-coup purges related human rights files against Turkey before the court. These trials might lead Erdogan to decide to leave Council of Europe to get away from the verdicts of European Court of Human Rights. Ihsan Yilmaz was professor of political science at Istanbul Fatih University between 2008-2016, lecturer in law at SOAS, University of London between 2001-2008 and research scholar at Center for Islamic Studies, University of Oxford between 1999-2001.